When you (plural) do church right, there are all sorts of things that naturally result. One of those things is that it becomes like family. But any of us who have truly been a part of a local church, for an extended amount of time, will tell you that this is true experientially as well. But listen though... I am not purporting any lovey-dovey-feel-warm-and-fuzzy sentiment here! Family can be tough. We all have that crazy aunt and the funny uncle and the favorite grandpa and the annoying brother and ... well... you get it. But it is FAMILY. You keep getting together. You keep calling each other. You continue to eat together and hang out together and take family trips when you can... and when these things aren't happening, it feels broken. When a rift comes in and separates family, it just isn't right. And in the Bible, the Gospel Family is supposed to be together. We are not supposed to forsake the assembling of ourselves together (Hebrews 10:25). We are supposed to love one another (John 13:34) and care for one another and bear one another's burdens (Galatians 6:2). 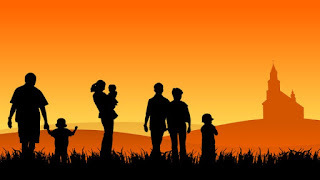 In fact, Jesus warns that the gospel will break apart many earthly families (Matthew 10:21, Luke 12:53), but as we are adopted into the family of God, we essentially have a new family... an eternal family. And this is why, when church is done right, there is a certain family experience that cannot be fully understood until you are truly committed to that church family. There are so many Christians that are missing out on these most beneficial and eternal experiences, simply because they won't commit. They don't know the joy of years of shared experience. They don't understand the deep feelings of love that can only come through the depths and the shallows of ministering together. Many don't even know what it is like to minster together, they have enjoyed being ministered to, but have missed the greatest joys and heartaches that can only come through the mutual burden sharing of the Christian community. They don't know the sadness of when a brother or sister leaves the family because they found another family that they like better. And they will never know the deep communal compassion of one who has not only shared a few Sundays, but has shared a life. If you are in a church, become a part of that church. Unless the church goes into an area of blasphemy or absolutely false teaching, commit yourself to them... adopt them as your family.